I have now mounted a Vectrex inside the cabinet. I have arranged it so that with the removal of just two screws the panel holding the Vectrex can just swing to a horizontal positon resting on a wooden dowel on the inside of each cabinet side. The picture shows the rear of the cabinet. Note, there is an original speaker positioned at the top of the cabinet - I will eventually connect the speaker to an amplifier which in turn I will connect direct to a pre amplification point on the Vectrex PCB (should remove some of that infamous buzz). Beyond the speaker (at the front of the cabinet) there is also space to put a back light for the marquee. With the help of the neighbour the cabinet was easily carried up the stairs to the back bedroom. However, it was whilst orienting the cabinet so it was facing the correct way a disaster happend. The neighbour grabbed the top of the wooden panel containing the hole for the coin box mechanism and exerted an upward lifting pressure and subsequently snapped off the wooden panel at the top of the hole. Out of all the places to grab the cabinet he grabbed it there! You should have seen my face whilst I tried to contain all emotions and the neighbour made a sharp exit. It can’t be fixed with glue, so I’ll have to get a new piece made. I doubt though if I can find similar finished wood, so I think I’ll just go for a black painted piece of wood. An all black wooden panel shouldn't look too out of place since the panel area is dominated by the black plate with the coin inserts. The photo shows what is left of the original panel after removing it from the cabinet. It’s in more bits because I struggled to get it out in one piece because quite a few wood dowels and a lot of wood glue had been used to originally fix it to the side panels. As the old proverb goes- If the mountain will not come to Mahomet, Mahomet must go to the mountain. In other words - If things do not change the way you want them to, you must adjust to the way they are. Faced with no good and obvious solutions for making the Vectrex screen larger I have decided to use the Vectrex with its built in display in the cabinet. Of course this looks a bit silly, so to reduce the silliness I will arrange to reduce the width of the cabinet. I have stated in previous posts that my goal is to make an arcade cabinet that would not look out of place in an 80’s amusement arcade. Well, maybe I have to compromise on that goal and say that my cabinet should not look out of place in a mid 70’s amusement arcade. The early games from then did use small displays. Take Pong from 1972. This was an upright arcade cabinet with a 13” B&W TV. So, true retro means small screens - at least that will be my argument. I wish developing this cabinet was a full time job rather than having to try and steal an hour here and there. There’s so much I want to do with the Vectrex but oh so little time. Anyway, although not much progress as taken place in the physical world with respect to the cabinet build I have been busy thinking (again) about the practicalities of a Vectrex based arcade cabinet. In the previous post I mentioned my concerns about the Vectrex display being and looking too small for the cabinet. Well, in fact that wasn’t the first time I had been thinking about that. For a couple of years now I had felt that the Vectrex display would look too small in a full size arcade cabinet and that would be the biggest stumbling block to achieving a realistic arcade cabinet. 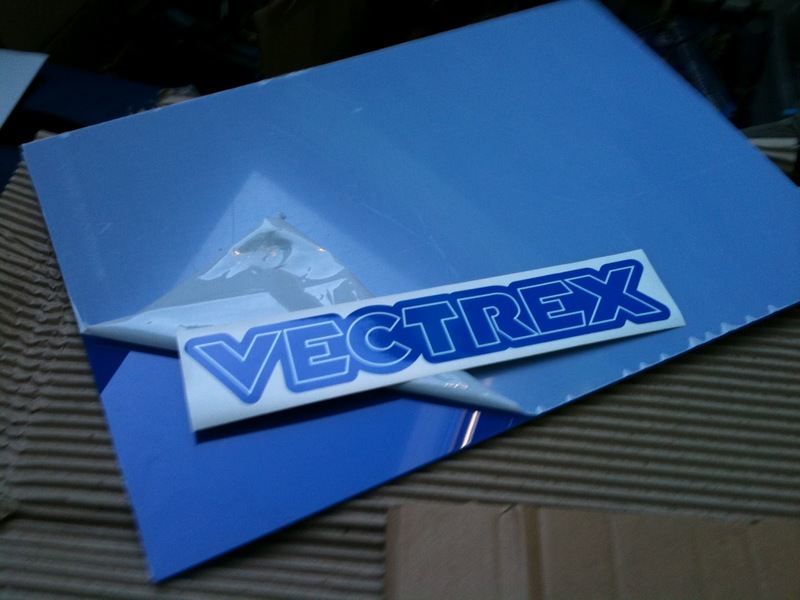 I mentioned a long time ago in my Sunday 23rd August vectrex.co.uk news entry that I would ideally want to use a 17" - 19" monitor with the Vectrex. It would have to be vector based and hence CRT based. 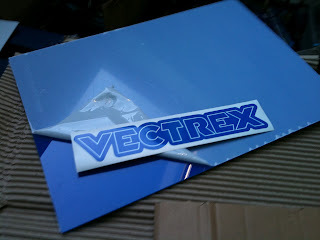 Forget about the electronic circuitry changes required to the Vectrex in order to operate it with a larger sized vector monitor (at least one person on the Vectrex forums has claimed to have done this) :- the bigger problem is that I’d been searching for three years and just couldn’t find a vector monitor anywhere. I did read some years ago about another Vectrex fan that modified his B&W CRT TV to work as a Vectrex vector display. However, I don’t have the knowledge on how to modify a TV and was unable to contact that guy. So at that time I made an investigation into alternative methods of getting the Vectrex to work with a bigger screen. I came up with something I called the Vectrex Optical Display Engine (VODE) module (you can see it on YouTube). The VODE simply housed an old 640x480 pixel digital camera operating in video mode and pointing at a standard Vectrex console. This camera was connected to a 22inch TV via its composite input. However, I was disappointed with the final result. Not only for the fact that the resulting graphics on the TV were comprised of pixels instead of crystal sharp vector lines, but also because the resolution of the camera was poor. Perhaps, if the camera resolution was significantly higher the results would have been better, but the result would still be less than optimal considering that the TV operates in raster scan mode. Next, I remembered that in the early days of television, they included lens to make the then small CRT screens appear bigger. I also recalled seeing adverts from the early 90’s where add on lenses could be purchased for TV’s and monitors. I believe it was in 2009 that Vectrex fan DarrlyB experimented with a Fresnel lens to magnify the Vectrex screen. He used a commercialised version of this type of lens which is normally sold as a book reading aid. It’s like a cross between a magnifying glass and a sheet of paper. I purchased one of these lenses too to carry out similar experiments. However, this type of lens was less than satisfactory. When you were not directly in front of the lens there was little observable magnification. I found that when I was looking off centre, the spiral structure built into the lens played havoc with the display of the vector graphics. On most of the games there seemed to be some strange prism and line spiralling effects. Another potential issue is, if I could have a bigger screen, I would also need bigger overlays. Some Vectrex fans like playing games without the overlays, but for me some overlays really do add to the game, take Pole Position, Vectrexians or Vector Pilot for instance. The accompanying overlays for those games really do add the illusion of colour. So all the above captured thoughts relate to problems, but worry not I have a solution….